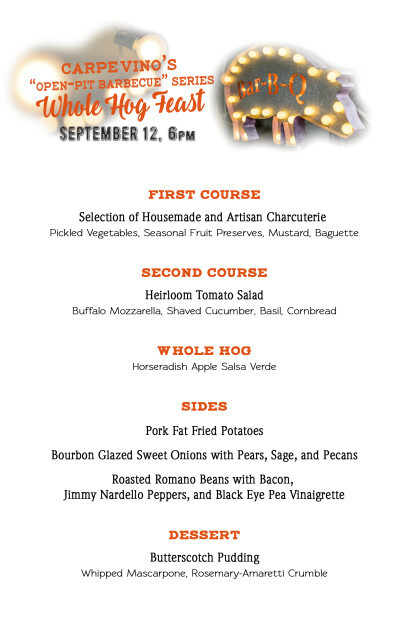 10 TICKETS AVAILABLE FOR TOMORROW’S WHOLE HOG DINNER! NOT TOO LATE! Tomorrow, Wednesday, September 12th we’re firing up the ole BBQ-PIT buried in the Carpe Vino garden for the fourth installment of our “Open-Pit” series. Chef Eric Alexander has had this 90 lb Sinclair Family Farm hog brining in mixture of water, salt, citrus, garlic and herbs (thyme, rosemary, bay leaves) for over 24 hours. Due to the massive size of this hog, Pitmaster Spencer Smith had to extend our cinder-block pit by an extra three feet! Smith will be pulling an all-nighter as this HOG will be laid on the grates around midnight for (roughly) 14 hours of smoking. TO RESERVE your tickets now for this Italian inspired-meets American South masterpiece of a menu….click here!